Please add $7.50 to cover shipping and handling costs. Thank you. **You Will Receive Two 8 x 10 Inch Laminated Photos Of Swale. 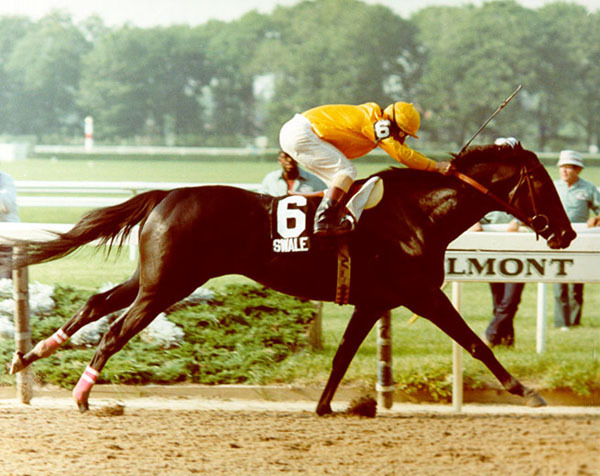 One will be of him in the Winners' Circle of the 1984 Kentucky Derby, while the other will be of him crossing the finish line victorious at the 1984 Belmont Stakes. You will receive them as FREE Gifts With Your Order! In addition to a check or money order, every wonderful patron may also choose to purchase directly through PAYPAL. All you need to do is click the button below the corresponding format that you wish to purchase. Please click the button below if you wish to purchase the 6 x 9 HARDCOVER version of GRIT AND VALOR: THE STORY OF SWALE. Please click the button below if you wish to purchase the 6 x 9 SOFTCOVER version of GRIT AND VALOR: THE STORY OF SWALE. Thank you very much for visiting. Take care and have a great day! Please come back soon! After you have made your purchase, please send me an E-Mail, so I can contact you with the exact date in which I mailed out all of your materials. Also, if you would kindly send me an E-Mail when you receive my package, I sure would appreciate it. Thank you very much!